This 40V dual power supply circuit was designed in response to a request made by Michael from Philippines. His application is to power the 150 Watt amplifier circuit published here. I think this power supply design is adequate for the purpose. The transformer T1 steps down the mains voltage, bridge D1 performs the rectification, C1 and C2 does the job of filtering.C3 and C4 are decoupling capacitors. The T1 must be a 230V primary, 30-0-30V secondary, 200VA transformer. All capacitors must be rated at least 63V. C3 and C4 are polyester capacitors. If 8A bridge is not available, make one using diodes like P600A. How to choose those capacitor value ? explain anyone. Hi..I also have this transformer 8amp two 30v AC output..how do I change its output voltage to 12 DCV? ?pls help..
is it posible to make -40V with out using negative regulator ic? hi seetha raman i want to make a INPUT 16 to 60V AC/DC. OUTPUT +5V-5V, 20 mile AMP power supply of plz send me the circuit diagram to my Email address. hi seetharaman, so if I want to change this power supply to a variable one, potentiometers at the output are not enough ? Transformer must be raised to 350 VA.
Current rating of the bridge must be raised to 12 or 15 A.
Fuses must be changed to 12A. Hi Mounica you require a maximum current limitting of 30% of the rated battery capacity that is 30amps (for flat battery of less than 11volts terminal voltage)and normal charging current of 1/10 of the rating that is 10 amps at 12volt. Hi Mounica you can use 100AHbattery for operating the UPS but it is not rated to charge it, hence you have use an external charger. this 100Ah battery will spoil the ups? what changing will i have to do for increase or decrease the voltage? if i want to make this transformer less supply for TDA1554 which gives 12v @5A what will i have to do? how can i connect or use a shunt regulator? Hi Adnan my PC is through I will send you by wednesday positively. Regarding these power amplifiers they are not Class A type that is conuming constant current, but they are class B type hence as per volume their current requirement vary from few mA to few thousands of mA. hence the voltage will vary from 12 volt to almost the AC supply voltage which is likely to kill all the components hence you have to use a shunt regulator to take care for the full current capability. (0.47 X 9) / 0.02=211.5uf apprx 220uf???? its mean i can use this power supply 12v @ 5A for TDA1554? what changing will i have to do for increase the voltage? Hi Adnan the max current can be 5 Amps at 12 volts. if you want to increase the output voltage the current will fall down. If you short the output the maximum current can be 5amps only. if use 220uf @ 400v instead of 12ouf what will be the output current @ 12volts? and if we want to increase the voltage what changing will required??? plz ,mail the revised circuit? plz ,ail the revised circuit? Hi Adnan if by chance if the output is shorted or load takes higher current as per the capability of the trransformer then the rectifier will get destroyed. hence it is preferable to use higher rating bridge rectifier. if we have 4Amp transformer then we have to use more than 4Amp bridge like 6amp why we use high ampere rating bridge?and what will happened if we use low ampere bridge when transformer current is high?? Please wait my PC will be ready this sunday you will positively get it on tuesday. plz send the modifies circuit with thyristor and zener u’ve told me last week? With 12 amp transformer your short circuit dissipation of the trasistors are 1200 watts 600 at + and 600 at -. That is you require around 20 transistors in parellel on heat sink. to reduce the number of transistors a thyristor to be added with suitable zener and transistor, you can make a very compact high current variable power pack. i will send the circuit by next week. 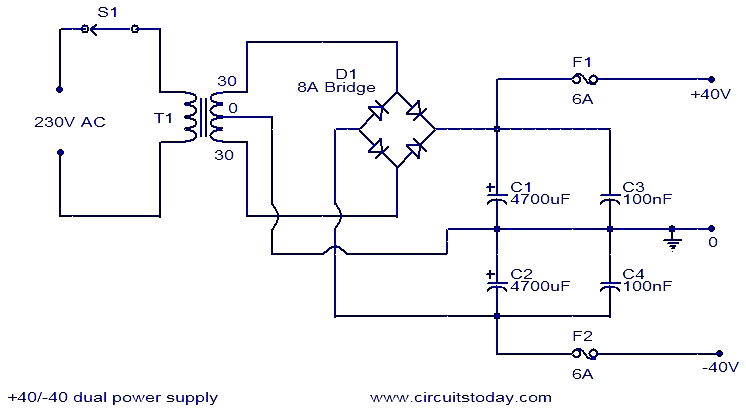 if i want to use 50-0-50v @ 12amp transformer in that power supply you’ve mailed me then what changing will be made except of bridge rectifier or will the circuit remain same?????? i understand all the working of this supply but tell me that why we use too much transistors?what happened if we decrease the quantity of transistor?n tell me if there any replacement exist to decrease the quantity of transistors? Hi Adnan please bear with me for few more days my desk top is down i am using my mini for just emails no graphics possible. Hi Adnan i will mail it to you in 3 to 4 days time sorry for the delay. IS THIS A SWITCH MODE POWER SUPPLY. Hi Adnan you can provide series pass transistors with its base being controlled by variable reference. Hi Adnan with higher capacity power supply(current) you can always draw lesser current. but not the other way round. Hi Adnan you have US$1000 in your account hence you can draw easily US$600 from your account. You can draw 6 amps comfortably. Hi Adnan why not for very low currents. for higher current add few series pass transistors. Any transformer you can use, out put will be root 2 times the AC input. if i connect two potentiometer in parallel at +40-0 and -40-0 will it become a variable power supply? if i use 35-0-35 @ 4amp transformer instead of 30-0-30 what will be the output? if i have a power supply of 30 volts 12 amp.Is this is possible to get 30 volts 6amperes from the 30volts 12amps power supply?? tell me the equivalent diodes for 6 amp bridge, 4 amp bridge and 2 amp bridge diodes name??? Hi ADnan the capacitor will get heated up and explode. For a 25 volt capacitor 20volt will be safe limit. in some capacitor they would have mentione the voltage at 85deg C. These capacitors can be used upto the rated voltage. if temp is not mentioned in a capacitor, it is to be taken as 25deg C and derate it and use it at one third the voltage indicated. since inside the equipment the ambient may raise to 75 deg C.
if i give more than 25v to a 220uf 25 volts capacitor what will happen?what will the output or the capacitor will destroy?? if i have a power supply of 30 volts 12 amp.Is this is possible to get 30 volts 6amperes from the 30volts 12amps power supply???? Yes you can use if you have space. if i need 220uf 50v capacitor but i have a capacitor of 220uf 400v can i use 220uf 400v capacitor instead of 220uf 50v??? By increasing the voltage of the capacitor will not have any effect on the output power. 200va / 60volt is 3.333Amps. 30-0-30volt transformer, both the 30 volt winding should be capable of giving >3amps current. 200va means how much amperes of transformer tell me? yes, the power supply ratings must be doubled. two seperate power supply will reduce noise, but it is very costly. Here a single power supply with double ratings is enough for stereo mode.